Today was a wet cold rainy wintery day! The perfect day for a steaming bowl of Beef Stew! 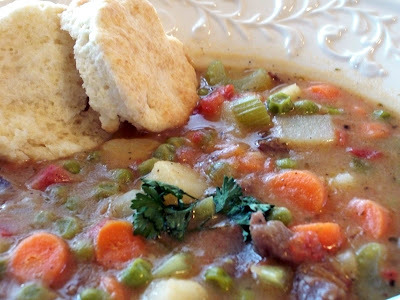 John has been asking me for a couple of weeks now to make Beef Stew for dinner, I don't know why I've been putting it off~ maybe because I'm still feeling some morning sickness and some smells and tastes are a little crazy to me! I felt like I had put it off long enough though and it did sound good to eat, so I went ahead and made it, feeling great with the end result! Heat stew pot to medium high heat with oil. Add chopped onions. Coat beef pieces in flour and add to oil and onions. Brown meat. Add Red wine vinegar, water, beef bouillion, A1 sauce, tomatoes, salt, pepper, thyme, and potatoes. Bring to boil then simmer for about an hour with lid on, then add peas, carrots and celery. Simmer for about another hour. Serve hot with your favorite bread. I find it amusing that you call a warm, sunny, 80 degree weather day cold and wintry. It is so funny to me when I think that other people in other parts of the country actually still have winter at this time of the year. I've been hungry for stew like this but haven't been able to justify it in this weather. It looks delicious! Oooo Hanne! you make the yummiest looking food!